University Village (colloquially known as U-Village or U-Vill) is a shopping mall in Seattle, Washington, built at the south corner of Ravenna neighborhood. Located north of Downtown Seattle, University Village is an open-air lifestyle shopping center which offers restaurants, locally owned boutiques, and signature national retailers. U-Village is a regional destination for home furnishings, popular fashions and unique gift items with a distinct collection of restaurants and eateries. University Village was originally developed by Continental Inc. who also developed Westwood Village in West Seattle and Aurora Village in Shoreline, Washington. The 24 acre (97,000 m²) shopping center was built in 1956 across NE 45th Street on an earlier part of the Montlake Landfill (since 1911, 1922–1966), taking out what remained of the Union Bay Marsh that was drained by the lowering of Lake Washington as a result of the opening of the Lake Washington Ship Canal (1913–1916). Some wetland was later partially restored as the Union Bay Natural Area with the Center for Urban Horticulture. Until the early 1990s, the character of University Village was decidedly different. Most of its businesses were small, and the chain stores were all local: Ernst Hardware and Malmo Nursery, Lamonts department store (acquired by Gottschalks in 2000), Pay 'n Save Drugs (sold to PayLess Drug in the early 1990s), and QFC supermarket. There was even a bowling alley, Village Lanes. Many of the businesses began to falter toward the end of the 1980s, however, and in 1993 the owners of the mall decided to sell. For much of this period, University Village was owned by the Tektronix Retirement Investment Fund. Amazon.com, an online retailer founded and based in the region, opened its first physical storefront at University Village on November 3, 2015. The campus of the UW is to the west and south, the neighborhood of Bryant farther to the east, and the neighborhood of Ravenna to the north, but portions of the surrounding neighborhoods are often referred to as being in "University Village" themselves, approximately west to 22nd Avenue NE, north to NE 55th Street, and east to Union Bay Place NE and 30th Avenue NE. The area's principal arterials are 25th Avenue NE and NE 45th Street; 35th Avenue is a minor arterial. Collector arterials are NE Blakeley-Union Bay Place NE and NE 55th streets. ^ (1) Seattle City Clerk's Neighborhood Map Atlas (n.d., map .jpg c. June 17, 2002). ""Ravenna", map". Office of the Seattle City Clerk. Retrieved April 21, 2006. Check date values in: |date= (help) Maps "NN-1030S", "NN-1040S".jpg dated June 17, 2002. (2) ""About the Seattle City Clerk's On-line Information Services", Information Services, Seattle City Clerk's Office". Office of the Seattle City Clerk. n.d. Retrieved April 21, 2006. See heading, "Note about limitations of these data". (2) Phelps, pp. 59, 68. 207–208. ^ Largest by square footage, alphabetically. Next largest are Anthropologie, Banana Republic, Fiorini Sports, Smith & Hawken, and Storables, alphabetically. 206 stores plus five offices. "University Village Map" (PDF). University Village. May 7, 2006. Archived from the original (PDF) on May 20, 2006. Retrieved May 21, 2006. (2) Ravenna Creek Alliance (November 9, 2005). "Ravenna Creek Alliance: Specific Info". EarthLink. Retrieved April 21, 2006. ^ Greene, Jay (November 2, 2015). "Amazon opening its first real bookstore — at U-Village". The Seattle Times. Retrieved November 9, 2015. 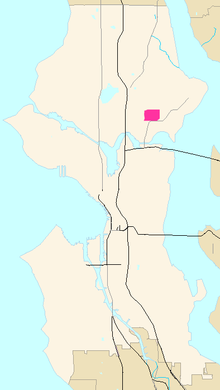 ^ Seattle City Clerk's Neighborhood Map Atlas (January 12, 2004). "Low-Resolution Version" (PDF). Street Classification Maps. Seattle Department of Transportation. Archived from the original (PDF) on June 22, 2006. Retrieved April 21, 2006. For browser use; other versions for printing, cf. Bibliography. From "Principal, Minor and Collector arterials" Archived June 14, 2006, at the Wayback Machine, Seattle Department of Transportation, 2005. Wikimedia Commons has media related to University Village, Seattle, Washington. "About Gottschalks". Gottschalks. n.d. Archived from the original on March 10, 2004. Retrieved June 21, 2006. "About the Seattle City Clerk's On-line Information Services", Information Services, Seattle City Clerk's Office. Retrieved April 21, 2006. See heading, "Note about limitations of these data". Clark Humphrey, Loser: the Real Seattle Music Story. Portland, OR: Feral House, 1995. "HISTORY @ UBNA" (Union Bay Natural Area). Center for Urban Horticulture (n.d., 1999 per "Montlake Landfill Information Summary, January 1999" on page). Retrieved April 21, 2006. "Map", Home > Information > Map at "Map", U Village. PDF dated May 7, 2006. Retrieved April 21, 2006. O'Neil, Kit, University Community Urban Center (n.d., 1997 per Chronology). "Ravenna Creek Daylighting Project". Retrieved April 21, 2006. Ravenna Creek Alliance (November 9, 2005). "Ravenna Creek Alliance: Specific Info". Retrieved April 21, 2006. Ravenna Creek Alliance (November 9, 2005). "What's New". Retrieved April 21, 2006. Seattle City Clerk's Neighborhood Map Atlas (n.d., map .jpg c. June 17, 2002). "Ravenna". Retrieved April 21, 2006. Maps "NN-1030S", "NN-1040S".jpg dated June 17, 2002. [no title], The East Side Journal, May 31, 1962, p. 3; Ibid. May 14, 1969, p. 19. "Street Classification Maps". Seattle Department of Transportation. 2005. Archived from the original on June 14, 2006. Retrieved April 21, 2006. Medium-Resolution Version, PDF format, 1.45 MB January 12, 2004. Low-Resolution Version, PDF format, 825 KB January 12, 2004. "Planned Arterials Map Legend Definitions", PDF format. January 12, 2004. "For information on the origin of the soda fountain see the "About Inventors" Website (http://inventors.about.com)."